On social media, we can engage in online conversations with people from all around the world, many of whom we have never met face to face. In many cases, we actually have met them “face to face” on video conferences and calls. For those of us with access to the Internet, we are truly living in a global community. Technology has made it possible to have meaningful and productive relationships with people across the globe. In a sense, these globally connected relationships make the global community a local one. The keyword in the above paragraph is interactions. Interaction is what distinguishes local from global. However, all interactions are potentially local, especially when there is a clear purpose. Therefore, local is more than close proximity — it is about shared values and outcomes. To me, global is often a code word for centralized or one size fits all. Many years ago, an American car company marketed what they called their world car. It was a phrase euphemistically used to describe a car they could market in any country. In reality, they saw this car as one size fits all. This global approach was not based on interaction or the recognition of local distinctions. Rather, it was a singular strategy that was intended to work everywhere. There is tension between globalized local interaction and the global one-size-fits-all approach. It is partly an issue of personal responsibility and individual freedom, and partly an issue of how a global society makes decisions that impact billions of people. A local approach is based on individuals making decisions that take into consideration their family members, neighbors, and colleagues, even if these people are on another continent. It is based on relationships, shared values, responsibility, and outcomes. Meanwhile, the old global approach assumes this is not feasible and that a central decision-making body should make these decisions. In effect, it distrusts interaction and collaborative solution-making. 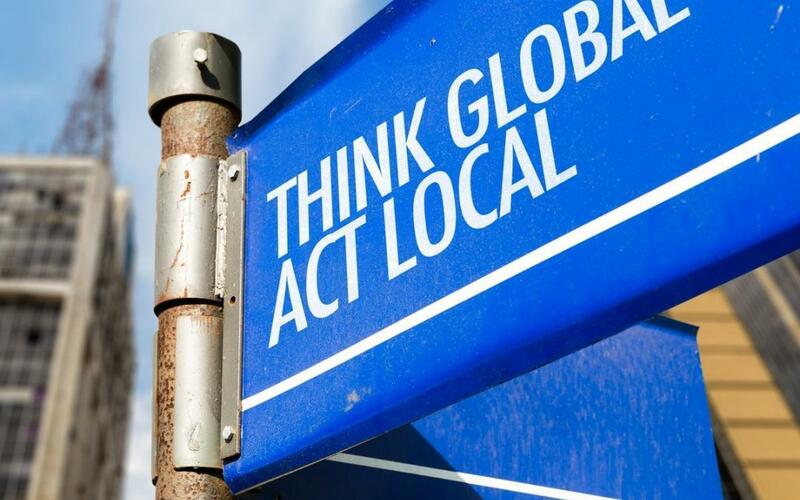 This distinction between local and global leadership is most significantly being played out in local communities. Here’s an example, in one city, the city administration sought to apply a globalized solution to the problem of city revenue (the hierarchical structure). However, the solution would have had an adverse impact on local business and would have led to more centralized control by city government over businesses and private property. This global solution would only benefit a small group of citizens and the city administrators by giving them more power and control over the economic assets of the community. A contingent of local citizens organized a network of relationships and exerted influence upon the city to reverse this globalized solution and were successful. This illustrates the power that local interactions have in a globalized context. They have a capacity to transcend the artificial barriers erected by traditional social and organizational structures (a.k.a. legacy structures). As new pockets of local influence grow and gain importance, the community’s ability to adapt to the changing social and economic realities grow as well. Legacy structures tend to be hierarchical and ordered for control of the system, rather than for interaction and initiative by individuals. We tend not to think of global approaches as representative of the old industrial model, but that is precisely what they are. It is an organizational design that assumes a few closely linked people who hold power on behalf of the larger community will make decisions that are beneficial to the whole community. This, however, usually turns out not to be the case. Fortunately, where legacy hierarchical structures exist, localized interactions are on the rise. In many cases, these interactions transcend the boundaries of the outdated structure. Local interaction makes a difference because it is where collaborative work takes place. The local is based on individual initiative rather than quiescent compliance. It is a more agile, adaptive, responsible approach because it is a way that those who are most impacted by circumstances are able to address issues over which they have control. When you are in a relationship with people regardless of how far you live from one another, you are a local group whose potential is far greater than the sum total of its members. The question for local groups is whether they can see beyond their own self-interest to embrace a set of values and outcomes on a global scale. This requires local leaders with a new global mindset. 1. Ideas come from our engagement with the world around us — near and far. This engagement may result from observing a situation in which people are in need, from a personal emotional desire, or from some notion we pick up from a book, article, or news story. The ideas that connect with us are related to other ideas, like our purpose in life, the mission of our business, the values that give our life and work meaning, or a vision for a better world. At some point, it all comes together in a singular idea that motivates us to take action. 2. Initiative is the beginning of all leadership. Without it, nothing happens. Many people have ideas, but many never act on them. When an idea is compelling enough, we take action. The action may be to research it further, to have a conversation about it, to ask for permission or clarification, or to go do it. Initiative is some action that starts the process of leadership. The most significant, sustainable, and impactful initiatives are those that are connected to our values. 3. Interaction is where action and progress take place. Individualism never functions in isolation from our relationships. The life and work we create are always within a context of interaction. When we begin to interact with people across the globe as well as in our own part of the world, we open ourselves up to new ideas and paths toward seeing our idea take root and find its impact. 4. Impact is the result of our ideas, initiative, and interactions. What we seek through those aspects of our life and work is change. Not random, discontinuous, purposeless change, but meaningful change that makes a difference that matters. People tend to measure their life experience in three key ways, and when they follow the above steps, their hopes and desires for themselves and their impact on their local communities measure up. Life is personally meaningful because it is connected to the ideas and values that matter to them individually. It is also socially fulfilling because relationships matter and collaborative effort result in important change with ripples that can reach around the globe. In other words, they have made a difference that matters.